Today's decluttering mission is simple, declutter your kitchen counters. Now, I know this is called a 15 minute mission, and when you read to declutter all of your counters in this time period you might just think, "ha! No way!" So realistically, if you've got a lot of clutter this will not happen in such a short time period, at least the first few times you do this mission. In fact, the whole first week of the 52 Week Organized Home Challenge is all about kitchen organization, focused on countertops and the sink area, so you've got many days to get this one accomplished. But remember, these missions are to work and make progress for fifteen minutes. You don't actually have to get completely done in that time period just to have made progress! Plus, sadly, but true, you wouldn't be able to keep your counters uncluttered with just 15 minutes once anyway, because life happens. 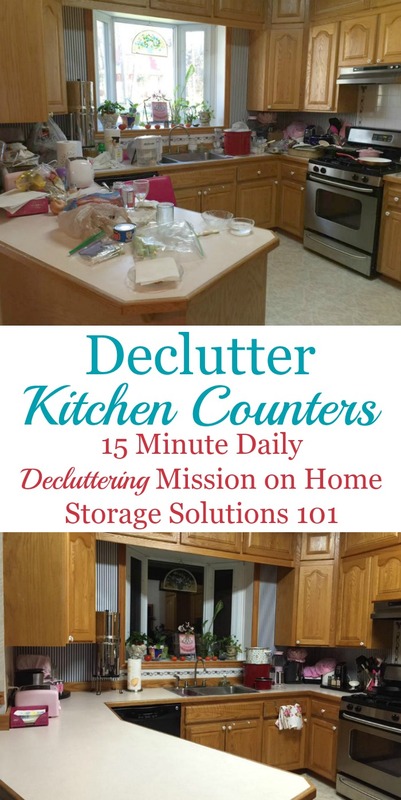 So read on about this mission, and also what I think about how to make this particular mission a daily habit, so you can actually have clear kitchen counters most of the time! Flat empty surfaces are just like an open invitation to put something down and leave it there. Unfortunately, this quickly leads to clutter, and since everyone is in the kitchen a lot it seems your counters get a lot of clutter accumulation quickly. What we want is for you to be able to realize the joy of having mainly clear kitchen counters, and then to be able to enjoy them most of the time. I could wax poetic about the joy of clear spaces for a long time, but suffice it to say that it makes a room feel calmer and more peaceful, it is easier to clean, and you actually have enough room for food prep and cooking when you've got clear space to work. There are three types of clutter on this flat surface, and I suggest you deal with them one type at a time. The first type of clutter is the obvious stuff that doesn't belong -- the hammer from the recent home repair, the school books that should go back in your child's backpack, etc. kitchen counters, but for some reason were placed there, and your job is to move them back to where they do belong instead. In this instance it is just as much about tidying as it is about decluttering. Get rid of this stuff first. Later, in the 52 Week Organized Home Challenge and corresponding Declutter 365 missions, we're going to spend a LOT of time dealing with paper clutter. However, I know that a significant amount of that paper clutter accumulates on people's kitchen counters. If you have a lot of paper clutter, and want to clear it while also clearing your kitchen counters, I suggest you also read through the Paper Organization Series here on the site, which will walk you through the process of decluttering your paper piles, for the big picture. For dealing with your paper piles though specifically, check out this decluttering, shredding or filing paper piles 15 minutes at a time. An example of this types of clutter includes appliances that you use, but maybe only every couple of months. The question you've got to ask yourself for these types of items is: (1) how often do I use it, and (2) where else could I store it, and how easy or complicated would it be to get it out when needed? I've found people's tastes about how much to keep out on their counters varies widely. Some people love a few decorative items or well-loved and used appliances to stay out, thinking it makes it seem cozy and homey, as well as convenient. Others want a bare and minimalist approach, choosing completely clear counters because it brings them calm and is more utilitarian. There is no right answer. You keep clearing your kitchen counters until you are happy with the result, and don't feel inconvenienced with having to get out or put back away various items that used to live on the counter regularly, but that you moved to a drawer or cabinet. Once you've got your counters cleared to your level of satisfaction, then the big trick is keeping them that way from now on. So read on below to see pictures of both cluttered and uncluttered kitchen counters that have been sent in by other readers, plus my thoughts on how to make decluttering your counters a daily habit. 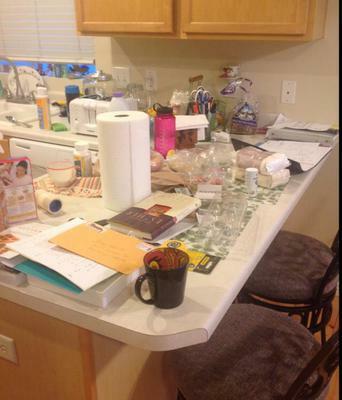 Real Life Examples Of Kitchen Counter Clutter: You're Not Alone! First, I want you to know that you are not alone if your kitchen counters are full of clutter. It happens to the best of us, and this site is not about judgment, at least not from me. Come to my house after a crazy day (or the next morning if I'm exhausted the night before) and you're very likely to see something quite similar. That's because clutter just seems to accumulate, like I've said before. So here's real life examples to drive home the point that you're not alone, and you're not a failure while "everyone else" has it together, all the time. The picture above is from a reader, Becky, who said when I first discussed this challenge on the Facebook page, "Ooohhh, good mission!" Here's some more for you. 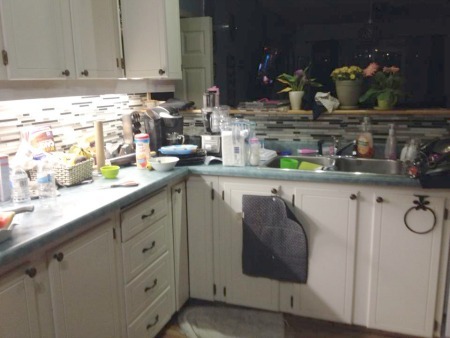 The first is from a reader, Rebecca, who said: "I try and clear my counters regularly, and then dh happens! Will have another go... Here's a 'before' shot (taken at end of day before clear up)." This next one is from Jennifer, who said: "I did mine this morning. Again. And this is tonight after dinner. I need a maid." Perhaps you can relate? Or look at the one below from another reader, Shirley. This is really a series of photos, and she explained that they are before, after "and 10 minutes after - the pictures nobody ever posts, when it is all getting messed up again." So as we've seen above you're not alone, and the kitchen counters get junked up fast, even as unfair as it seems, including right after you've cleared them off. Make it a habit to declutter your kitchen counters daily as part of your kitchen tidying. That statement, I realize, is both exceedingly simple to say and often very complex to put into practice. But no one can deny that consistently putting away things, tidying up, and dealing with one or two pieces of clutter as they occur is so much simpler and less time consuming, and less stressful, then dealing with big mounds of it. On the other hand, no one wants to be the person screaming or grumping any time something is laid down on this flat surface, because goodness knows if that was the case we'd be upset all the time. So here's my solution for making this a habit without losing your mind. You can go crazy if you immediately try to deal with every bit of clutter as it happens. So I like to think of each evening having a "reset." What this means is that during the day you just don't stress about it, but each evening you do a reset, and make sure all the clutter is dealt with, perhaps by doing this particular decluttering mission every single night. It keeps you sane most of the time, because it can only get so bad in a short period of time, and then you fix it before it gets too out of hand. Once a day reset will work for many many people. But I hear you already, as I write this, "but Taylor, if I let it go all day it would be a disaster by the night!" OK. I grant that can happen in very busy households, or where you've got an extremely tiny kitchen, or . . . whatever reason for this to happen for you. Well, if that's the case you just are going to have to do your reset more often. But I change my pattern during the summers when all five of us are in the house basically all day long, every single day. Then, if I did just one reset a day I would be drowning in clutter. So instead, during the summer I do a reset after breakfast, lunch and dinner. Often these resets don't actually take a full fifteen minutes anyway because like I said, if I deal with these things consistently it just doesn't seem as overwhelming as waiting for it all to pile up. So, that's how I suggest trying to make this mission a habit in your home. 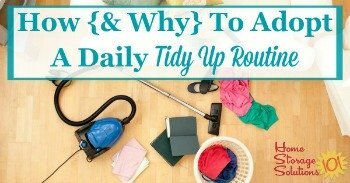 You can read more about how and why to adopt a daily tidy up routine here. 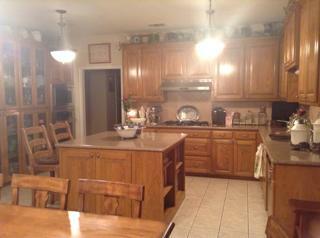 The pictures above are from a reader, Debbie, who showed off her clutter free kitchen. She explained, "Every night when I cook, my kitchen is a mess; however before I finally get around for bed, kitchen is neat and tidy again." So basically, she does exactly what I'm suggesting, and has made her kitchen clean up and clearing of clutter a daily habit. Hard to argue with those results! The kitchen looks gorgeous! See below for even more inspirational pictures from readers who've taken up this mission and seen real results! Completely Clear Kitchen Counters Feel Amazing! Cleared the kitchen counters!! Feels amazing. I haven't even missed the items I thought would be hard like the spoon jar or knife butcher block. Now, a note for everyone. Recently I posted an article explaining why this woman had decided, like Amanda, to completely clear off her counters of everything. I personally don't think you need to go that far. My rule of thumb is that only things you use regularly, such as daily, should stay out on your counters. 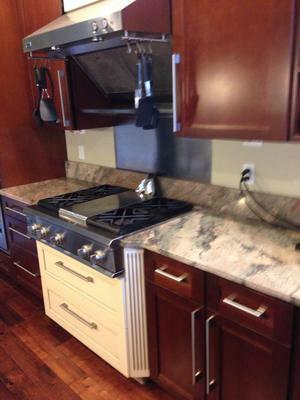 Everything else should have a different home in a kitchen drawer or cabinet typically. But you can make whatever rule for yourself you want, that works for you. Amanda found completely clearing them worked for her. That can be a good idea if you suffer from clutter blindness, where you start to not to see it after a while. Then, even regular items you use may lead to "just one more thing" syndrome, and soon, your counters are again cluttered. So if completely putting everything away works for you, go for it! On the other hand, if you find it a pain to put away stuff you use daily (like I do) you don't have to go to this extreme! Keep out the coffee maker, or the utensil crock, or whatever, and still feel good about the way your kitchen looks. 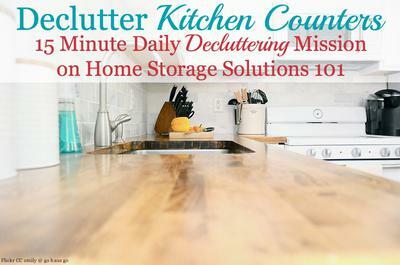 Take The Kitchen Counter Organization Challenge & Declutter Mission! DDs' Using the Breakfast Bar, and sink. So I hope you're now convinced that keeping your kitchen counters mainly clear most of the time is a good thing, and with some consistent effort you can do it, I'd like you to do one last thing! If you've got the second type of clutter that I was talking about at the beginning of this article -- the stuff that does belong in the kitchen but not necessarily on your countertop, take the Week #1 Kitchen Organization Challenge. That will make doing this daily mission much much easier. "I cleared clutter, and got rid of a bunch of not useful decorative items. I have been on a mission of paring down for the past couple of years, but this is giving me an organized way to go about finishing the job :)"
I hope seeing these pictures has inspired you to declutter your kitchen counters. 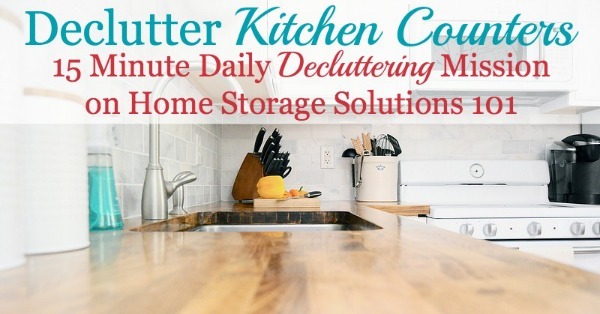 Comments for Take The Kitchen Counter Organization Challenge & Declutter Mission! I agree with getting clutter off counters, but I, personally, prefer a few decorative items on my counters. Without decorative pieces a home looks vacant, unloved and unlived in to me. I use a decorative red canister, candle and knife block on one end of the main counter and a marble rolling pin on a wooden base, and a fanciful ceramic cat on the other end with the red coffee maker. Removed piled up (but not action Items) clutter from kitchen counters, found and relocated small appliances to better locations. The only things on my very limited kitchen counters are a microwave, toaster oven, knife block, paper towel roll, coffee pot and dish drainer. I use all of those items at least once a day. I have been looking into putting my paper towels under a cabinet, but I rent my apartment and they have weird rules. I have too much counter space and it looks very stark with nothing on them, as if no one lives there! Direction from an expert and giving myself the freedom to adjust any suggestions to fit my own home personality! We moved last year into a small, older home with some reno's being needed. We promised each other we would live in the house for a year before tackling the bigger issues. The kitchen IS the heart of the home. Without a doubt as we have raised 4 beautiful & independent kids who are fabulous people. We know how much it is used and abused and then polished up again! For me, this is a GREAT place to start so as our adult family returns from time to time - it will function well with 10 of us as much as it will with the 2 of us. "The journey of a 1609.344 kilometers (aka: a thousand miles) begins with a single step." Use command sticky mounts to put things up under cabinets. I am happiest when I'm making something in my kitchen and my family knows that. For my birthday last year I got a new pistachio green KitchenAid mixer. It doesn't get stored in a cupboard. It gets prime real estate on my kitchen counter. I call it "my precious" (Hobbit reference). I have it on a clear glass cutting board so it easily slides out to where I use it. When I'm done it is easy to wipe it down and wipe the glass area around the base of it and then push it back into its place. The best part of all is when one of my boys asks "Will my precious be making cookies today?" Of course! I have a vacuum/sealer appliance that might not get used at all if I have to drag it out of a full cabinet. I prefer to leave it out but tucked into a corner so that when the occasion arises it is ready to use and saves me money by extending the life of the food I seal. I could have sworn my kitchen counters were uncluttered and clean. 45 minutes later they were. What a nice improvement. I agree with other members, nothing on counter looks too bare. I like to have a few things that make it MY kitchen. Unfortunately I have a very small home so it always looks cluttered. One good tip I got from this site is find other place for appliances that I don't use everyday. Can't wait to see my home get decluttered 15 min. at a time. One trick I used after the kids left for college and I had no intention of having a cluttered house anymore was to buy wicker baskets. Found them at Marshalls for about $10 - $15 dollars. Mine are rectangular. I bought 4 placemats at Pier One. Little clutter things go into the baskets closest to them and are covered with a placemat. The kitchen always looks cleared and calm. I'm using your tactic to go thru the baskets at faithful intervals and empty them out completely and start fresh with an empty basket again. I also have on junk drawer that needs faithful attention I haven't given it in years. The baskets keep the appearance of clutter at bay. At the end of the day I wipe down all the kitchen surfaces and there are no pencils, scissors, etc lying around. I have decorated the counters with things so it still looks lived in with a personality. I have a bamboo dish drain with perfect plates and bowls positioned just so; we never use these dishes. It just looks like we do. The colors of the plates and bowls match the olive green and mustard tones of the walls. Again, I got these plates at Pier One, Marshalls and Goodwill. I put out a huge black wicker fruit basket (Pier One on clearance) and force myself to fill it decoratively with fruits and vegetables each Sunday. With it being right out in front of us we are eating all of it within the week. A plus! We have Yankee candles jars on the counters. Stacks of mail go into a basket not on the counter. Dishes go directly into the sink. I don't have to freak when company is coming. I have the illusion of a perfectly clean house. it's just hidden. Now I just have to go thru the hiding places and declutter them on a regular basis! Put a good sized picture you enjoy under a piece of clear plexi... maybe someone you love - and you won't want to put any clutter on it. I have the flu....still. Somehow I reached the senior category, which I thought was like 83, a decade or so earlier. If you have ever actually had the flu you know that horizontal is the only way to go. Mostly a friend drops single serve portions in bags at the door. I throw out things I would have always recycled, reused, composted. It's still surprising what accumulates when standing over 5 minutes is just silly. So I am investing in a cleaning person to wash floor, empty sink, etc. When alone and help is needed get it to keep the habit going. First, my children are grown and away from home, so other than occasional cherished visits from them and the grandchildren, it's only my husband and I. And he always puts things away. So I'm the only culprit. Second, I have ADD/Executive Function Disorder. Starting this challenge may be the best thing I have ever done. You all are my support group. Last week I made my clutter box and my notebook. I didn't put too much time into making them, however, because that is part of my problem. If I get creative in that I get my accomplishment high and lose my drive to actually use them. So the only satisfaction I get to claim from them is actually using them. My rule for the clutter box is that I either put something where it belongs or it goes in the box. I put my clutter box in an otherwise unused corner nook in my kitchen and I empty it every day before I go to bed. Knowing that this challenge was coming up I did a sweep of my counter tops on Saturday. No recipes, receipts, food, bags, memorabilia, grandkid’s drawings, stuff that wouldn’t fit in the breadbox (went into the freezer), extra aroma candles (I had every one I’d ever received sitting out for ??? reason? ), pretty salt and pepper shakers (truthfully they only get greasy when I cook), and other stuff that I no longer remember. On my counters I now have: a cookie jar, a toaster (yes, we use it once or twice a day), a breadbox with a small basket of fruit (I don’t like my fruit cold, so I now keep one of everything in the basket) on top, a spoon rest (on the stove), my knife block and two utensil barrels. I get the dish drainer out (from under the sink) only when I’m handwashing dishes and—so far, remember this just started on Saturday and now it’s Monday—I empty the drainer and put it away immediately. I decided not to do my usual "I’ll wait until I have enough dishes to make it worth washing." On my island right now I have one pretty placemat in the center for decoration. My cutting board is upside down (little suction cups facing up) on top of the refrigerator. The only thing on the refrigerator. And that is that. And nothing is in the sink. Not always true, but it is true today. I haven’t had any dishes to wash by hand. At night I make sure the sink is cleared and everything is put away. Then I take my clutter box and empty it where it belongs. I like everyday items like utensil crocks on the counters. It gives a kitchen 'personality'. With the counters completely clear, it looks boring and like no one lives there. The dilemma is what amount is just right and what is too much clutter. In the end, though, the homeowners make the decision on what makes them comfortable. I love a small lamp and picture on easel on my countertops. Usually it's a family photo that's seasonal from the past years. My husband and I are retired so that means we are at home a lot. I have found that I have to reset my kitchen after every meal or it will pile up. So I have trained myself that everything has a place and is in it, and nothing is on the counters except essentials. Life happens and if I skip a day, it begins to pile up. I have to be vigilant. But is it so nice when I have unexpected company like today and the kitchen is clean and organized. It feels so much better to clean off the counters. I couldn't just stop there. I did challenge day 4 and five on the same day. This alone made a huge difference in my home appearance. I wish you lived next door to me! You'd be hired. I'd leave and you could do your magic and then leave a note for me telling me where everything is. ALAS! I'm in Indianapolis. My garage is right next to kitchen. I have a 5 shelf pvc thing a few steps outside the door. My crock pot, an electric broiler, casserole dishes are nested on it, plus my Ninja bullet. If I want one it takes 30 seconds. If dusty a dishtowel fixes anything. I don't do \ have junk clutter. I have cupboards that are too full. There's no room for kitchen items we own. No pantry. When we remodeled we replaced the old cabinets, then refinished them and nearly doubled our storage. Before that food actually sat on the floor in boxes. It's a 1970s split level house, eat in kitchen. I hate it but never give up. Always shuffling, discarding, trying to be inventive. I would like to have less on my counter, but have very little drawer and cupboard space in which to store things. Thoughts? I clean off my counters after each meal. I have things on my counter tops but they are not clutter at all. It's important that your kitchen reflect your personality but it should not reflect your clutterness. I think a clean kitchen is important, but a kitchen with personality and no clutter shows the true refection of what you are trying to show others. Small steps are important so whenever you have a chance put the small things away continuously and have a place for them to put them. At the end of the day your kitchen will be easy to clean up but it will also be ready for your needs the next time you want to use it. I know, not feasible to move constantly, but I was able to pare down a lot. 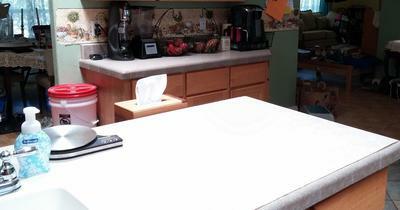 I have been able to keep my counters pretty clutter free except for one spot. In that spot I placed a basket and I place all those miscellaneous papers and such in the basket. I try to go through either once a week or when it is full. It also helps that I can easily lift the clutter out of the way when company comes or I need extra space. After my son (he's 10) went to bed, I did some decluttering. The next morning, in reference to our largest kitchen counter, he said "Wow, you really cleaned that off!" All of us would love declutter counter space, but when you have very limited storage space to put items away into how do you accomplish this. What takes space on my limited counter space is my microwave oven, coffee pot, and slow cooker. All of those items require an electric socket to plug into and take 3/4 of the counter space the rest is used for dish drainer for drying dishes. Above all this is cabinets, one side is my pantry for dry goods for cooking and the rest for storage of all dishwater not being used. All my pots are under counter in one cabinet under flatware drawer. The under sink cabinet holds all soap (dish and laundry needs) and the last one holds the dry items like aluminum foil, etc. I usually have to do all preparation for cooking on sink using cutting board and special drain board. As this is a rental apartment, I can't make any remodeling fixing so I have to live with this older styled kitchen. The space is so tight, my refrigerator is right by stove. So happy to see these pics as I thought I was the only one with really bad clutter!!!! I go to friends houses nothing on their counters, table on anything in sink. When I make myself leave the kitchen clean (and for me, that means a white sink, too!) at night, set the coffee pot so that we have only to press a button in the morning, mornings are much, much nicer. It is a pleasure to walk into a clean kitchen. It is truly amazing how much clutter can make you feel horrible. I want my home--all of it--to be a place where it feels good to be, and clutter prevents that. I love this website and recommend it to my students too. I live aboard with my DH and 2 furbabies. Keeping a tidy tiny kitchen is a project. Trusting the suggestions and missions will improve our tiny slice of heaven! Most of those shots had so many cabinets in them, I don't see how it would be difficult to keep counter tops uncluttered. When you have a small kitchen, it's a lot more difficult. Storage space is crucial. After moving from a larger house with a large utility for all the overspill I found the only way was to drastically prune and discard. If it's not in regular use it has to go. Same for the rest of house too. No fiction books, all on e reader. It's still an ongoing project, I guess we had too much stuff. My husband makes the coffee every night, much to his credit. However, I have a spot set aside in the cupboard above the coffeemaker for the beans and filters. But he insists that they be on the counter. I could make sarcastic comments about his right arm being too weak to lift the coffee can, but I have accepted the fact that if I want fresh coffee ready and waiting in the morning I have to put up with the coffee can and filters on the counter. Guess you can't have it all. Ever since we moved into our new house my husband had gotten into the (bad) habit of having piles of mail, bills, reminder notes, and more on one area of the kitchen counter. The area got bigger and bigger! This Christmas, under the auspices of getting ready for a party, I moved it all to our office, which he rarely went in. Turns out he loves it! Apparently he is one of the people who feel calmer with a cleared space when you first walk in. Before, he was feeling stressed every time he saw his piles of papers. Now he is using his area of the office more. 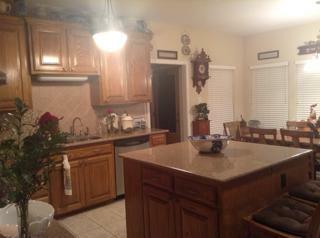 Yay for clean counters in the kitchen!! So, only the 3rd of January, but already feeling encouraged and inspired - having a kid home from college is a challenge with clutter, but husband & I agreed to start with the weekly & daily challenges. We both run a small retail business that leaves very little free time, and we don't like to use it cleaning/decluttering. But we did 1/3 of the counters yesterday (got rid of 2 small appliances that we never use that collect "stuff") and I did the next third this morning including the sink. My teenage daughter went back to school this morning after Christmas break and was very happy to see how clean & decluttered the kitchen is getting. Actually looking forward to attacking the few "junk" drawers soon - once we have be decluttered each room, closet, drawer, etc. our family goal is to maintain and not get back into a clutter rut. My counters are better but I need help with where to put bread cookies etc. I've searched this site and Pinterest. Did I miss something? Thanks. Try putting your coffee can in a pretty canister with the filters on top. Remember the old canister sets that would sit on the counters? I always feel like I am decluttering our home 🏡. I was excited to do this challenge and to stay focused at the task at hand and not end up all over the house. My hubby and I just want to simplify our home and life. 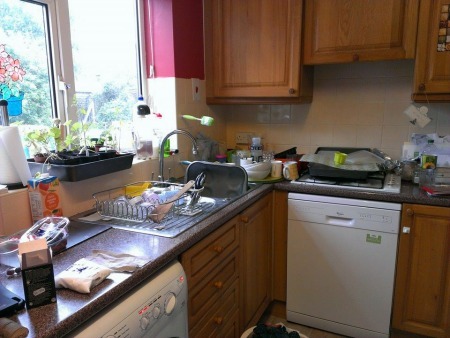 The worktops look great (I can actually see them) and there was a table under all that clutter. Now I'm looking very critically at all the other surfaces thinking, "Hmm I think you might be next!" I agree that decluttered counters feel amazing, I make it a point to clean the counters & table & sweep the kitchen floor every evening. Making this a habit makes a difference in how cluttered my home feels & actually helps reduce feelings of stress! Someone suggested using a wine rack for the counter. I found a wine rack that holds 4 bottles at Menards and it was on sale. It fits under my microwave and has cleared my counter by the sink. We really like it. I've always said --- The more space you have, the more junk you collect. It's our nature. I had 15 people staying at my house from 28DEC17 to 02JAN18. My counters were overflowing with everyones stuff. This challenge came at the perfect time. It took a while and now the counters look better than before everyone arrived. My goal for 2018 is to keep them looking so great. We have lived in lots of different houses with vastly different kitchen configurations. Flat surfaces gathering clutter was the main problem in all of them. And never leave a room empty handed. It takes time to get in the habit but it makes a difference. Loved your comment- will precious be making cookies? LOL! I like the thought that we each need to set up our kitchen as it works for us. We can get suggestions, but then we use what we need. Sounds like we need to teach our family members to clear the countertops before they walk away from it. We as women spend all our time picking up and cleaning up after everyone else. I suggest a small plastic basket for each household member, place all their stuff in it and tell them to come get it. Whenever they work on a project on the countertop before they walk away they clear it and leave nothing on it when they leave, and it wouldn’t hurt for them to wipe it down before they walk away. Habits need to be learned early. Boys can be just as responsible as girls. If you’re big enough to make the mess they’re big enough to clear the mess. I’m a Nana and a childcare provider....... therefore I have Christmas ornaments and sock snowmen the kids are working on in the corner of my kitchen counter! Ugh!!!! Glass balls, hot glue gun, sequins, paint and brushes, ribbon, socks, google eyes, red Pom poms. Is it over yet!!!!!!!! Hello. Any tips on clearing vitamins on the counter? I do not have any room in the bathroom or anywhere else. Thanks. This is a response to the question asked about clearing vitamins off kitchen counters. The question stated, "I don't have room in the bathroom or anywhere else." Wittingly or not, I think this comment hit the nail on the head. The reason your counters are cluttered (or at least one of the reasons) is that everywhere else in the kitchen is full. The cabinets are full, the drawers are full, the bathroom is full, etc. 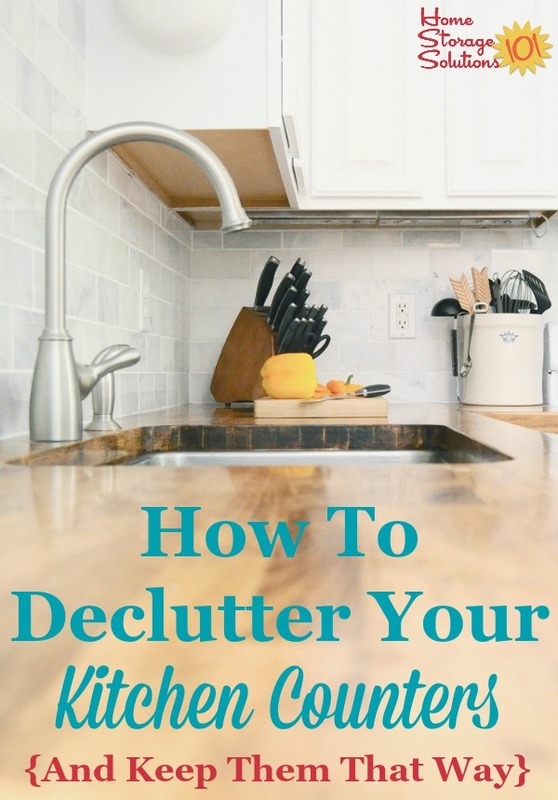 As you declutter you're going to find you do, in fact, have more space than you thought, when you get rid of the stuff you never use that is shoved in your kitchen cabinets and drawers, for example, that keeps you from putting away the stuff you do use (like vitamins) which is why they're stuck out in the kitchen counters. So my biggest suggestion for putting stuff somewhere else, when you don't think you have space for it, is to declutter areas around the kitchen counters, such as cabinets and drawers, so you can find room. That being said, here's my tips for organizing medications, which can give you ideas for storing these items on the counter, in a cabinet, drawer, or wherever else you choose to put them.